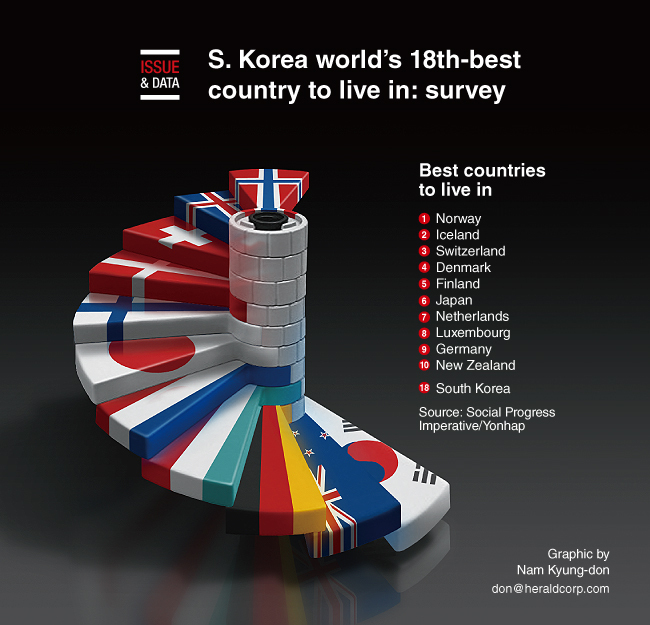 South Korea is the 18th-best country in the world to live in, a survey by a US nonprofit organization showed. According to the Social Progress Imperative, Korea earned an overall score of 87.13 out of 100 in its social progress index survey for 2018, ranking 18th out of 146 nations surveyed across the globe. Last year, the Northeast Asian nation ranked 26th. The index aggregates 51 social and environmental indicators that track three aspects of social progress: basic human needs, foundations of well-being and opportunity. The organization began compiling such data in 2013.